$695 for the set. Vintage 2pc Room and Board sectional sofa. Room and Board's sectionals are in the $2000 range. This sectional was used in a home staging, so has very little wear. 4 cushions on each piece. Generous size seating. Upholstered in a neutral beige ultrasuede. Super comfy! Arrange in a 90 degree angle, or the 2 pieces facing each other, or as a single sofa-lots of options. Perfect for your living room. Each section measures 61in wide, 31in deep, 31in tall. $695 for the set. Vintage 2pc Room and Board sectional sofa. Room and Board’s sectionals are in the $2000 range. This sectional was used in a home staging, so has very little wear. 4 cushions on each piece. Generous size seating. Upholstered in a neutral beige ultrasuede. Super comfy! 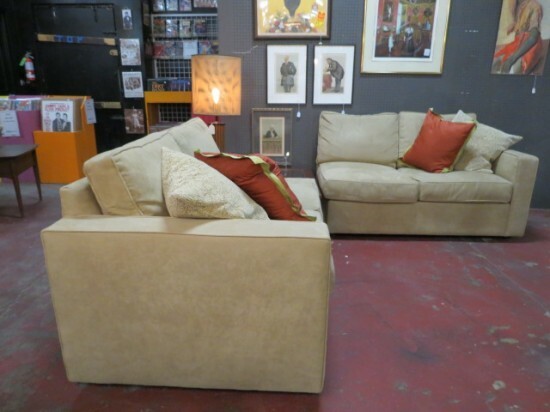 Arrange in a 90 degree angle, or the 2 pieces facing each other, or as a single sofa-lots of options. Perfect for your living room. Each section measures 61in wide, 31in deep, 31in tall.